A manufacturer of enclosure cooling systems prevented the loss of future production and eliminated downtime. Could this type of cooling be suited to your environment? The story is all too familiar. Your best customer places an important order for a custom made product that is needed as soon as possible. The company is even willing to pay rush charges to speed the delivery process. You give the company a firm delivery date and don’t foresee any problem getting the job shipped out on time. The raw materials are there and the job is set up and running fine when suddenly, disaster strikes! Half-way through the production run, the machine grinds to a screeching halt and refuses to budge. That’s exactly what happened to Lasercraft Inc. of Fairfield, OH, manufacturers of precision laser-cut metal parts. Most of the country experienced scorching heat last summer where temperatures soared to record levels. For Lasercraft, June brought the expected heat wave. The building was uncomfortably warm but production ran without a hitch. However, as the days pushed into mid-July, the temperatures continued to rise. The 90°F+ days combined with heat put out by their laser cutting machine took the temperature of the non-air-conditioned shop up over 100°F. Soon, the heat took its toll on the electrical enclosures of the laser cutting machine. The computer produced a lot of error messages and stopped the operation. Lasercraft tried numerous times to get the program to run with no success. As it turned out, the main CNC circuit board failed and required shipment to Australia (the manufacturer’s principle location) for repair. The situation got worse. It took three days to get a temporary replacement computer cabinet. On top of that, the heat in its free-standing control cabinet was shutting the computer monitor off. This “meltdown” left Lasercraft no choice but to move the job to their Cleveland location until the repairs could be made. The urgency to keep their good reputation and meet delivery times made finding the proper cooling product Lasercraft’s first priority. After reading about heat exchangers, he concluded they would be too impractical since there was very little difference between the hot cabinet temperature and the outside surroundings. He had also considered the Freon-type air-conditioners similar to those on other panels in the Lasercraft building. Based on past experience, Mr. Hauck considered them “a constant maintenance project of their own” and as a result decided against them based on their ongoing hassle of keeping the filters clean and the Freon charged. Finally, he found EXAIR Corporation of Cincinnati, Ohio, who manufactures a Cabinet Cooler that met all their requirements. EXAIR manufactures Cabinet Coolers that are compressed air powered. They incorporate a vortex tube to purge the enclosure with cold air. “After finding EXAIR on the internet, I recalled seeing their Cabinet Cooler. Honestly, I had my doubts that something so small could deliver the cooling we needed, but was pleasantly surprised after installing it. Their staff calculated the cooling capacity and told me there was a 30 day no risk guarantee. I figured I had nothing to lose, so I ordered it and it arrived the next day”, Hauck said. While Lasercraft was waiting on their repaired computer board, they outfitted the cabinet for their laser cutter with the UL Listed Cabinet Cooler System. Lasercraft also purchased a second NEMA 12 Cabinet Cooler System to mount on top of the monitor control panel. The Cabinet Cooler came complete with everything needed to get it up and running. There were numerous features that made EXAIR’s Cabinet Cooler the best choice for Lasercraft. It was easy to install, compact in size, readily available, maintenance free, quiet, reliable and inexpensive. It took Lasercraft only a few minutes to install the Cabinet Cooler through a standard conduit knock-out punch on top of their cabinet. Since EXAIR’s Cabinet Cooler has a built in relief on the unit, it wasn’t necessary to add any additional holes in the enclosure to get the hot panel air out. The compact footprint of the 2,000 Btu/hr. Cabinet Cooler measuring only 1-3/8” in diameter by 8” tall, permitted mounting with minimal space. A cold air distribution kit incorporating vinyl tubing with adhesive clips permitted routing of the cold air to those electronic components most susceptible to high temperature. Most important to Lasercraft was the fact there are no moving parts to wear out, meaning the Cabinet Coolers were maintenance free. The only requirement was clean, dry, oil free compressed air at 80 to 100 PSIG. EXAIR’s system provided a filter/separator for removing the dirt and water from the compressed air to keep the inside of the enclosure contaminant-free. Since Lasercraft's compressor system was a few years old, they also purchased an optional oil removal filter to keep oil from the compressed air from passing into the enclosure. Both units purchased by Lasercraft included thermostat control to maintain 95°F (35°C) inside each of the cabinets. This is accomplished with an electrical thermoswitch that actuates a solenoid valve. It turns the compressed air on only as needed to minimize its use. The 95°F thermostat setting allows the enclosure temperature to stabilize well below the 104°F (40°C) limit of the electronic components inside, without going extravagantly low which would waste air. The thermostat accuracy is ± 2°F of that setting so there isn’t a risk of failure. “It’s hard to believe that you can get so much cooling out of one of those little tubes”, said Hauck. “In the cool mornings, it never operates but as the day heats up, the thermostat turns the Cabinet Cooler on and off in short bursts to maintain the temperature in the enclosure”. Lasercraft soon realized an additional benefit. Previous to installing the Cabinet Cooler, it seemed that dust and smoke in the environment always seemed to infiltrate the electrical enclosures on many of their machines. It was typical to open the door of a machine and find a black “sooty” mess covering the insides. The EXAIR Cabinet Cooler kept the enclosures sealed, preventing dirt and dust from getting inside. “As a matter of fact, we have recently added one of EXAIR’s NEMA 4 Cabinet Cooler Systems to one of our CNC lathes just as a precaution, even though there is a Freon air-conditioner already on it. I’ve seen how gummed up those filters get with the coolant and dirt. I don’t want this to happen again”, Hauck said. 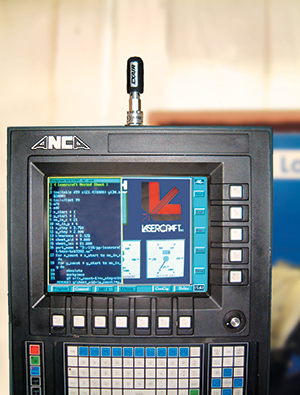 Lasercraft Corporation has a customer base involved in the automotive, aerospace, construction and machine tool industries. It cannot afford to keep customers waiting while it fixes summertime overheating problems in its electronic cabinets. Lasercraft desired a simple design, easy installation, low cost, and reliable unit to combat the common problem of summertime heat and downtime due to overheated electronic enclosures. EXAIR was able to meet their requirements and provide a solution to beat the heat. 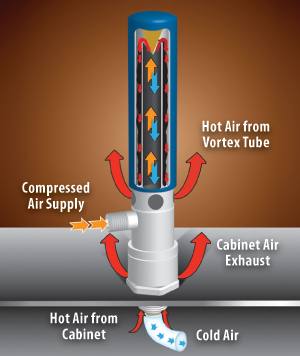 Click here to learn more about EXAIR's Cabinet Coolers. EXAIR Corporation was founded in 1983 as a manufacturer of compressed air-operated products to solve problems in industrial plants. These products are engineered to reduce air consumption and increase safety. Our products meet or exceed OSHA and CE standards while also compliant with RoHS, and REACH where applicable. EXAIR products include Super Air Knives, Cabinet Coolers, Engineered Air Nozzles, Industrial Vacuums, Vortex Tubes & Spot Coolers, Air Amplifiers, air-operated vacuums and ionizing products for static elimination.